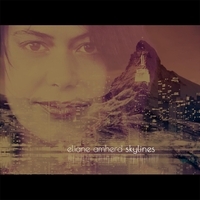 The new album from vocalist Eliane Amherd continues to show incredible promise for someone who displays incredible talent, not only in her voice but what she selects for her new album, Skylines (self-released). It’s partly jazzy but it’s rich with pop tendencies, soulful vibes and occasional reggae grooves, showing the kind of diversity that a lot of modern singers are often afraid to do. It would be too easy to compare her to Norah Jones but that’s due to the shared vocal harmony and charm but Amberd is her own person, whether it’s the Herbie Hancock-esque “”Counting Grains Of Sand” or her cover of Janet Jackson’s “What Have You Done For Me Lately”. She is someone who is letting people know what she is about and if you liked her previous album, the songs here are saying “I have much more to give and share, please stick around.” Glad she has returned with this new effort. Even as a kid, when I listened to some of my favorite female singers, I liked it because it sounded cool and they sounded like grown-ups. When I grew up, it turned into something with confidence, maybe something sensual, but it still sounded like someone who was of age. There were tons of singers like this, and then it became the “in” thing to want to sound pre-pubescent. It is great to hear a singer like Eliane Amherd whose music sounds like she is truly feeling the lyrics she’s singing, and that it comes from a woman, and not an 11 year old emoting. Now And From Now On (self-released) is that singer you have always wanted to hear, or at least a singer you wished were in abundance these days. To my ears, she sounds like what would happen if Norah Jones let her inner Patty Smyth (of Scandal), Pat Benatar, and Natalie Cole out. In a track like “Where Is Home”, performed in a slow tempo, she’s observing the world around her and where she is, and she asks the questions all of us have asked at one point or another in our lives. Throughout she touches on everything from rock to pop and jazz, even the bossa nova feel of “Let Me Explain” is a perfect fit for her, sounding like those classic albums of the 1970’s where a singer felt like touching on a “different” genre but because it was different, but because embracing a musical form is what made the story of the song a better one. With the exception of her cover of Tom Waits‘ “Temptation”, all of the songs are Amherd originals and as I heard her stories, it felt great to hear them knowing that the singer I’m hearing is the one who wrote and felt the lyrics being said. For me at least, it allows me to be a bit closer to who Amherd may be, even if it’s just in song. Now And From Now On is the kind of album that would rank up there with Melissa Manchester‘s Melissa and Natalie Cole’s Thankful in terms of creativity, impact, and emotion it offers and delivers to its listeners. This is the pop music that pop music itself forgot it could be.